I prefer to speak of South Hall as the “grande dame” of the humanities...Queen of languages, philosophy, political science, and literature. To me she has always looked like a slightly top-heavy old frigate loaded to the “gunwales” reeling, veering about, sailing against - or - with the winds of changes, bulging and billowing with her precious cargo of Cornellians who fill her every square inch. -Professor of English Liz Isaacs ’39 “Echoes of South Hall." 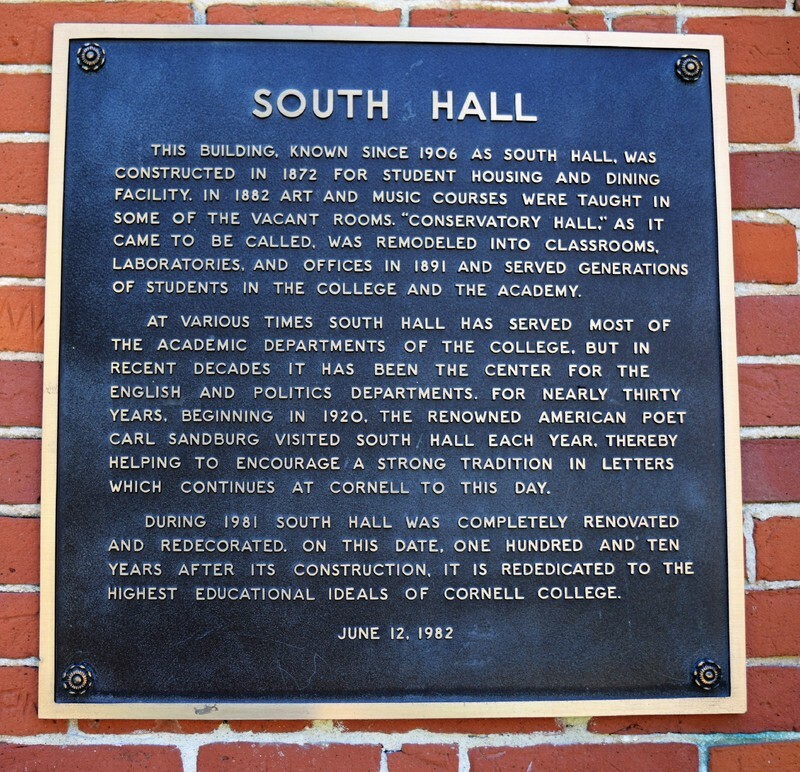 South Hall is Cornell College’s third oldest building, completed in 1873 at the cost of $10,000. It is the only building constructed as a result of the students’ petition, as the men of the college felt left out because they weren’t given boarding facilities (women lived in Old Sem, which was then called the Ladies’ Boarding Hall). Initially called the Gentlemen's Boarding Hall, or the Cornell Boarding Association (CBA), it contained twenty-two dorm rooms capable of housing two students each. 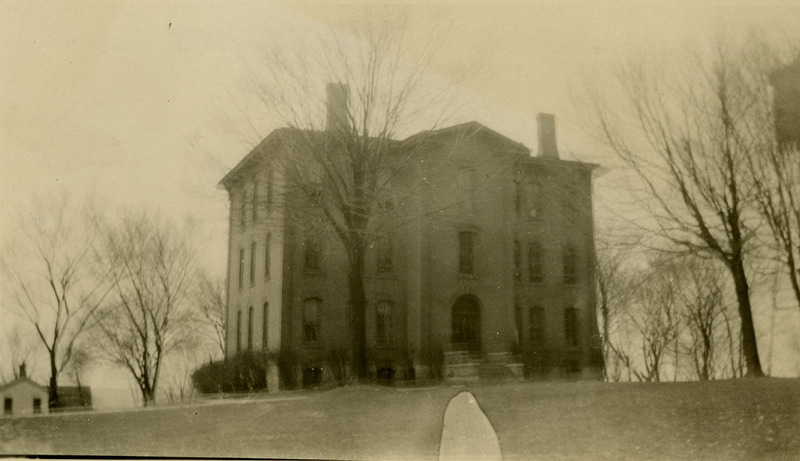 The first floor had a 2-room apartment for the cook of South Hall and her family, who worked in the basement dining hall. Living conditions were not ideal, and there is at least one recorded instance of students attempting to shoot at rats. 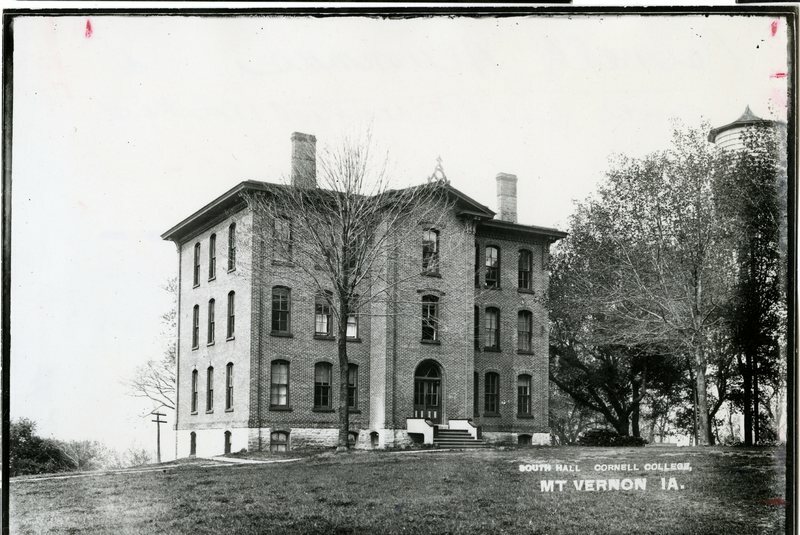 Prior to the construction of the heating plant in 1917, wood stoves present in each of the dorms rooms were used to provide warmth. Boarding costs were $1.25 per term, or $3.00 for a full year, comparable to the private housing rates many of the men already paid. 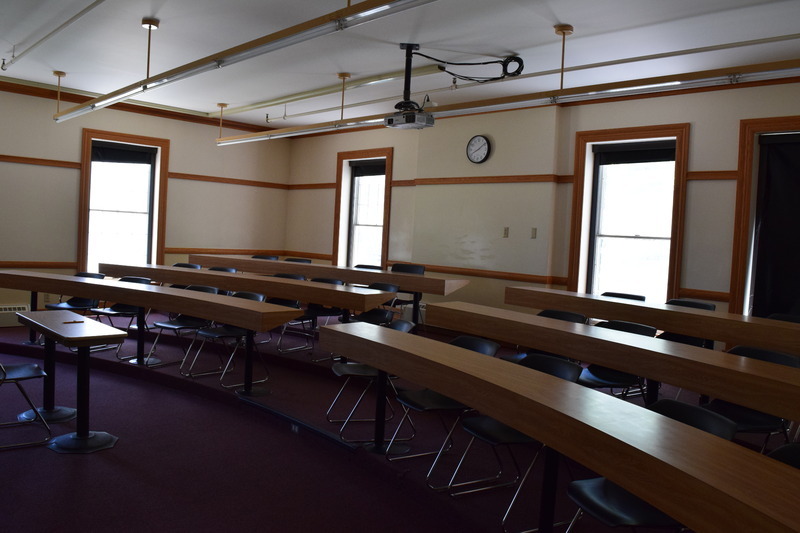 However, the strict rules enforced by the CBA made students reluctant to live there, and by 1891 the Board of Trustees decided to convert the building to classroom space, to better utilize the building. Even though the building was used as classroom space, the YMCA built four showers and a tub in 1898, making this the first bathing facility on campus available to male students. 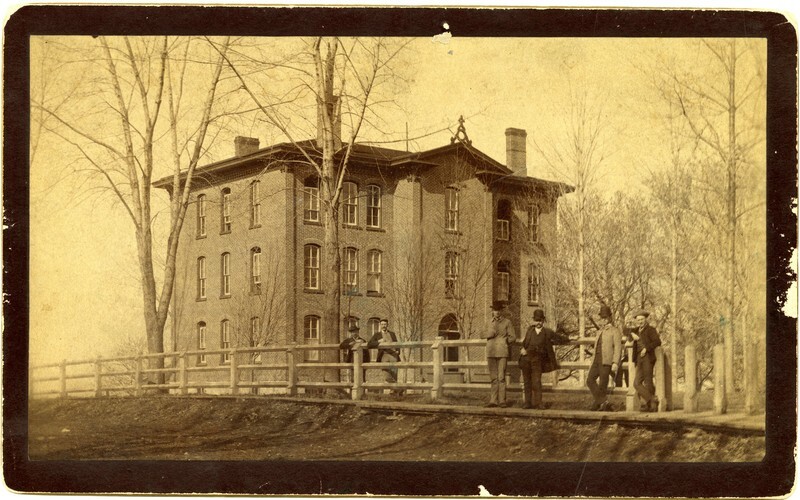 Due to the decreasing number of residents, Cornell’s newly created music department began using the upper floor of the Gentlemen’s Boarding Hall in 1878, changing the name of the building to Conservatory Hall. 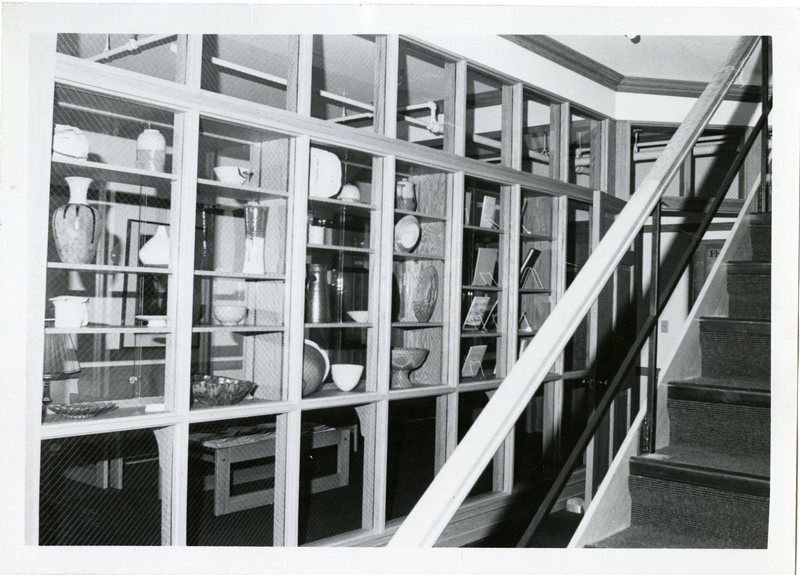 After the building was remodeled in 1891, it ceased to be used for student housing, and the geology department took space on the first floor, while the galleries of the art department established themselves on the third. 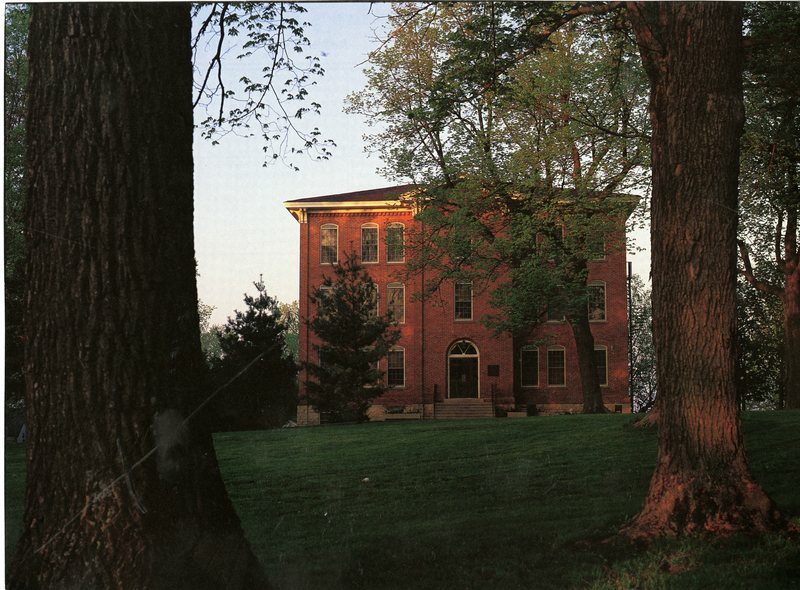 By 1906, the music conservatory abandoned the building for Lytle House, and the building became known as South Hall. 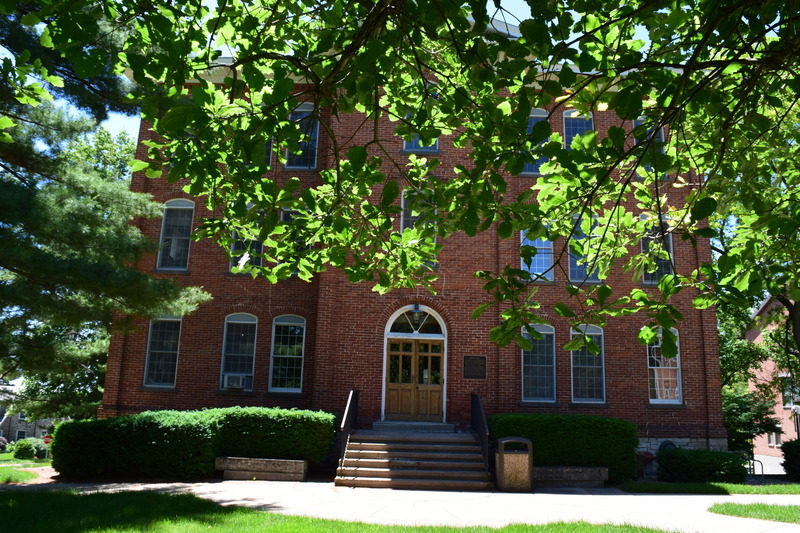 The geology department would move to the third floor, while the first floor was shared by the English department and Cornell Academy, a prep school that was run by the college until 1921. At one point during the 1890s, South Hall hosted a natural history museum, which was the victim of a prank by several students. They broke into the building one night, and the following morning students walking to classes were greeted by a bear in a tree, an alligator in a fountain, and birds in various trees, all taken from the taxidermied animal exhibit. South Hall has, over the years, been host to almost every department. 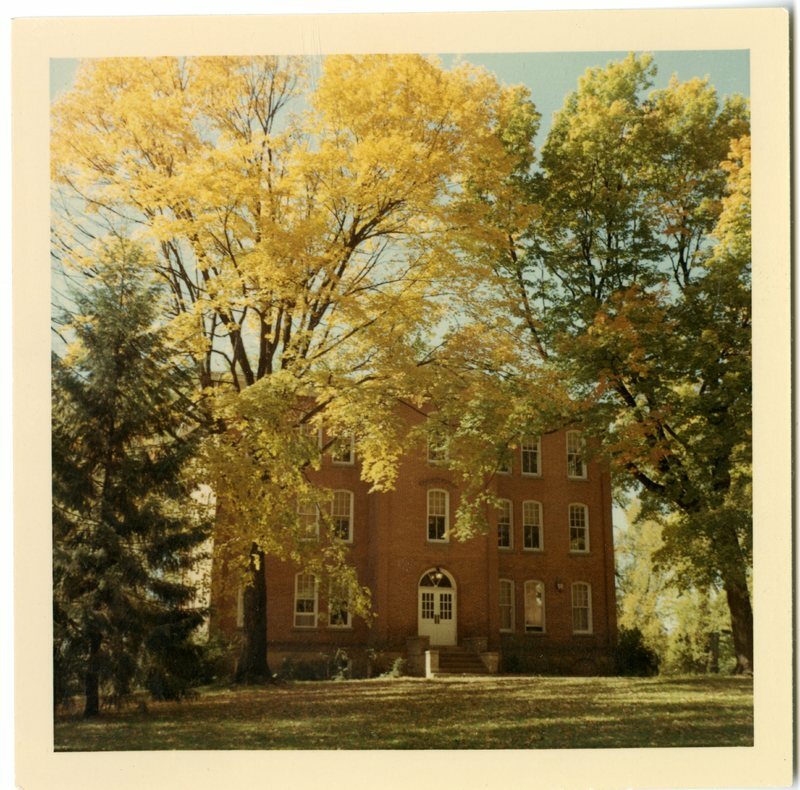 Until 1982, South Hall hosted the departments of geology, biology, chemistry, engineering, archaeology, psychology, history, political science, Greek, English, French, German, education, and secretarial training, in addition to art and music. It also housed the commandant of the Cornell Cadets for a time in the early 1920s. The basement in South Hall would later become the location for the Hillside Press, the first operating printing press at Cornell College. 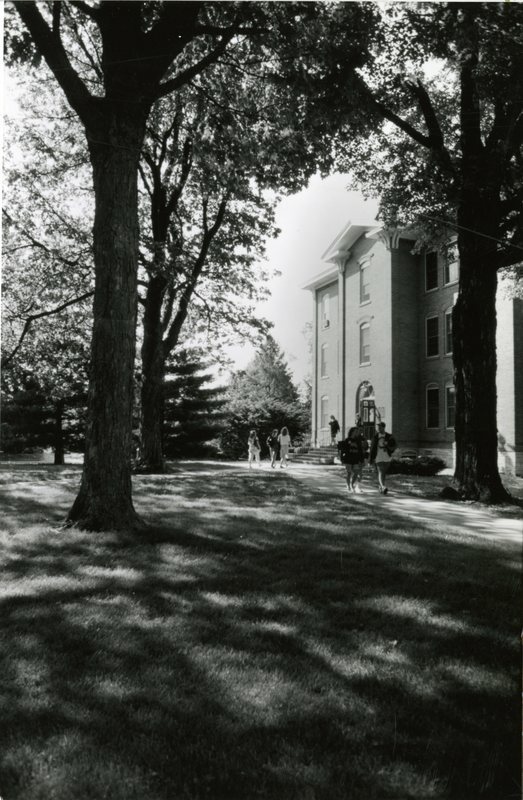 In 1960, South Hall was renovated once more, with new floors, stairways, furnishings and a sprinkler system. These improvements appear to have been ineffective at revitalizing the building, as one professor called it “decayed, decrepit, psychologically depressing and a disgrace to the kind of education that took place here.” By 1972, the Board of Trustees considered tearing the building down. Faculty and students rallied to save the building with a petition containing 155 signatures. But the plan to destroy the building was abandoned before they submitted the petition. 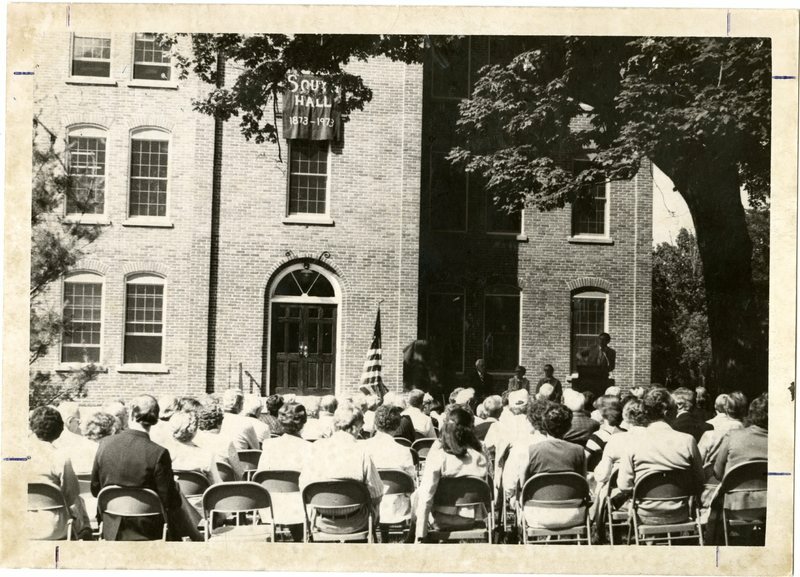 On June 12, 1982, South Hall was rededicated after undergoing a series of renovations to make it suitable for the humanities departments. Today, South Hall is home to the English and politics departments, ensuring the continued use of this historic building. 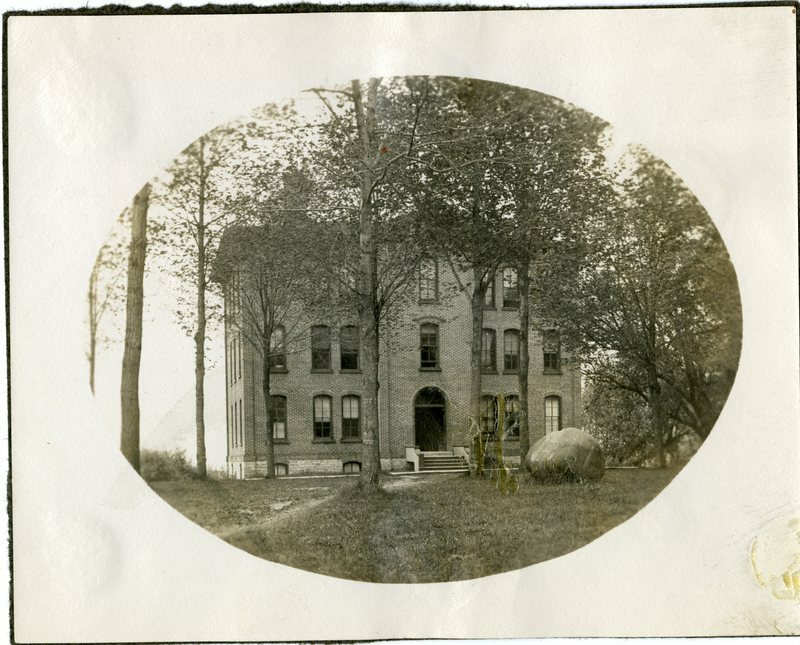 South Hall, Mount Vernon, Iowa: South Hall as seen from 5th Street SWq ~ Source: Cornell College Archives ~ Creator: Unknown ~ Date: Late 1890s? Art Rogers, an employee of The Hawkeye newspaper, was the founder of the Hillside Press in the early 1930s, an independent publishing group that was first located in the First Street building that once housed Mount Vernon’s fire station. In October of 1935, the Hillside Press, under Tull’s direction, began publishing Cornell Chapbooks, which included the works of various Cornell students and faculty. The Hillside Press also published Clyde (Toppy) Tull’s literary magazine, The Husk, founded in March of 1922. It produced four issues a year, which could be purchased by members of the English Club for a subscription fee - initially it cost only 30 cents, but by the late 1940s it cost as much as $1. Professor Liz Isaacs ’39 remembers fondly the electric printing press used to print both The Husk and the Chapbooks, as well as Tull’s enthusiasm for teaching students about the process of printing. 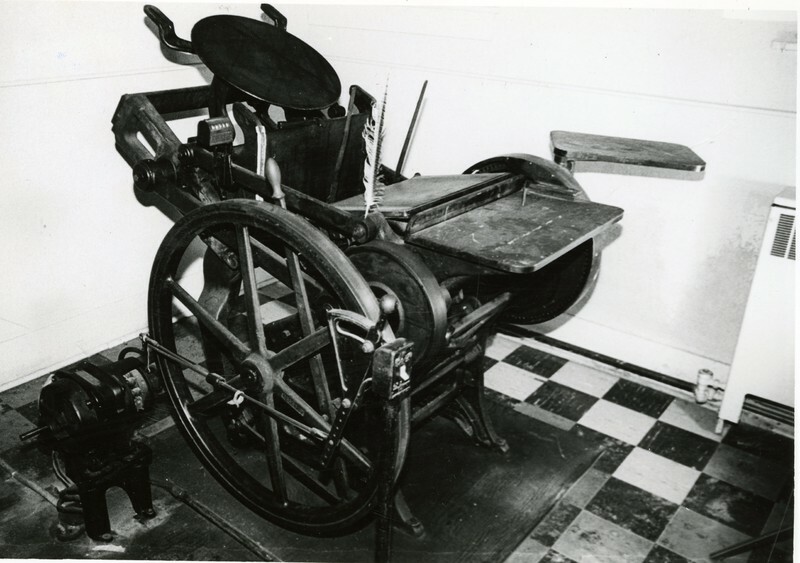 The Hillside Press became responsible for printing the Chapbooks, while The Husk continued to be printed on the Hawkeye press. The Husk published not only the work of Cornell students and alumni but also notable writers such as Carl Sandburg, who was a friend of Professor Tull’s. 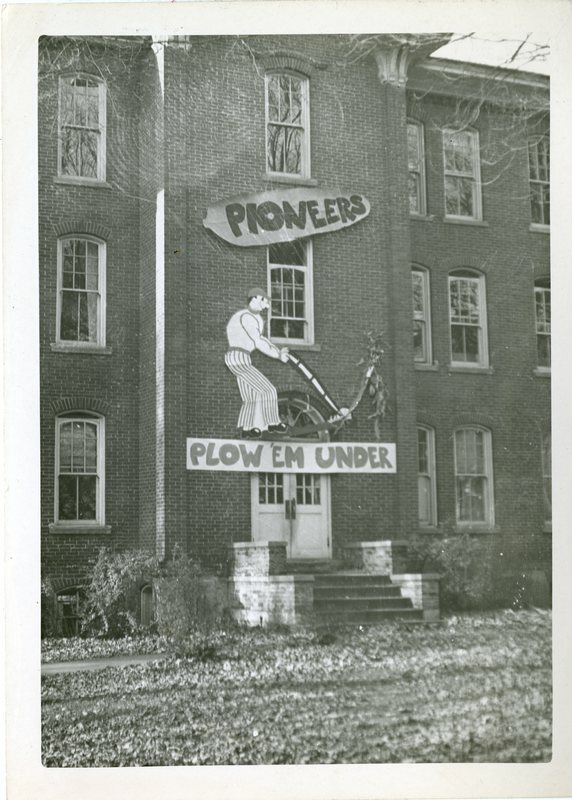 Even after Professor Tull transitioned to teaching only one class a semester in 1948 he maintained a crucial role in The Husk’s operations. One of these critical elements was the letters he wrote several times a year to members of the English Club, which he referred to as “clan-letters,” which were sent to all subscribers of The Husk (most of them had a small section devoted to reminding readers to pay their subscription fees). 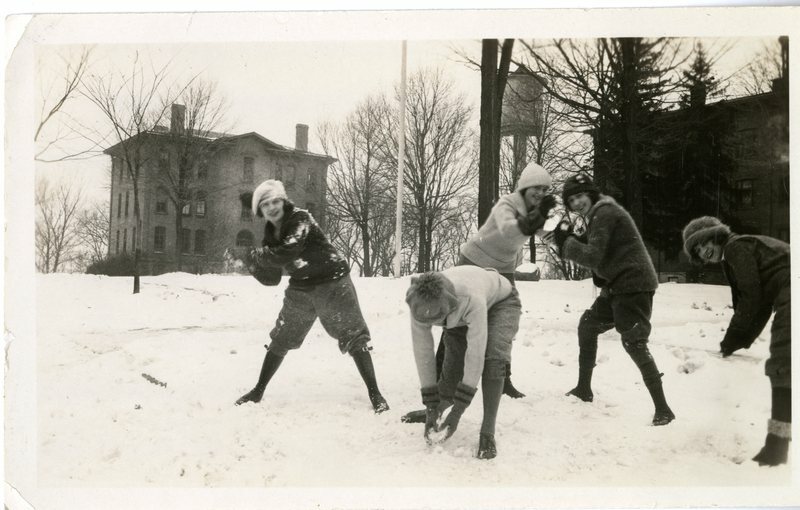 Through these letters, Professor Tull kept open communication with alumni as well as current students, informing all of the different literary events and including other anecdotes about campus life. Professor Tull handed over editing duties of The Husk to Professor Winifred Van Etten when he retired in 1961. The Chapbooks appear to have ceased printing sometime in the early 1950s, but were revived a decade later by students under the direction of English professor Robert Dana. 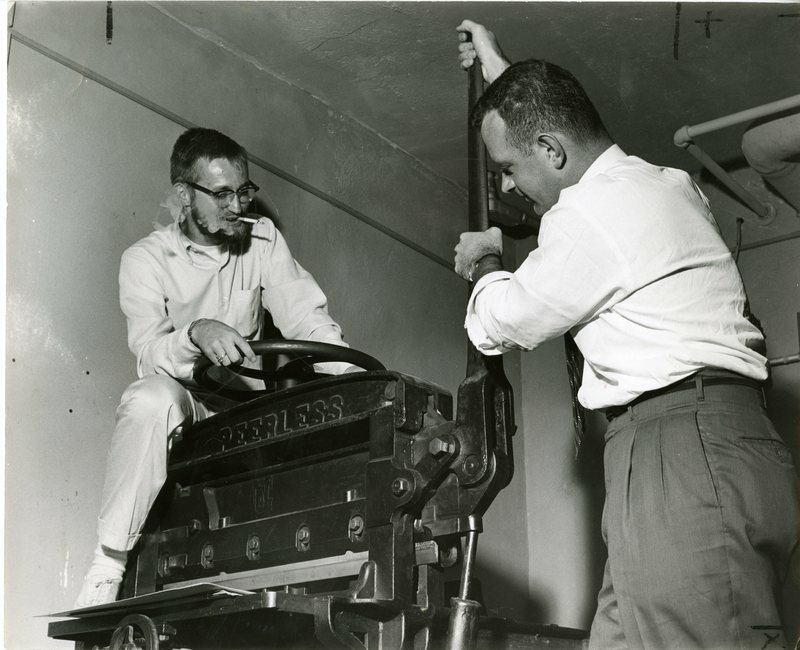 Dana had purchased the Hillside printing press from Art Rogers’s widow shortly after the printer’s death in the mid-1950s and set it up in the basement of South Hall. Hillside Press was worked by a combination of student and faculty volunteers during this era and managed to publish one or two books a year. The purpose of these Chapbooks, according to Dana, was to involve students in the publishing of important works of literature and enlarge the audience of up and coming authors who couldn’t yet attract the attention of the larger publishing companies. This mission appears to have been fulfilled, since four of the five poets published in those Chapbooks went on to win a major literary award within a decade. From 1957-1961 the Chapbooks printed both poetry and prose, but due to the amount of time that printing prose took, that practice was discontinued after 1961. Student poetry was still printed until 1967, and after this the printing press was only used sporadically, due to lack of student interest. The printing press was eventually sold in 1981, just before renovations began. The end of the Chapbooks coincided with the end of The Husk, which was unable to print in Mount Vernon after a fire destroyed The Hawkeye printing shop in 1968. Though one additional issue was published in Cedar Rapids after the fire, maintaining The Husk had simply become too much of a burden for the Cornell faculty, and the student body had grown largely disinterested. 1968 was also the year that Professor Emeritus Tull died, bringing an end to a great literary era at Cornell College. Today, the legacy of The Husk lives on with Open Field, a literary magazine established in 1968 and published through the efforts of the English department’s students and faculty. 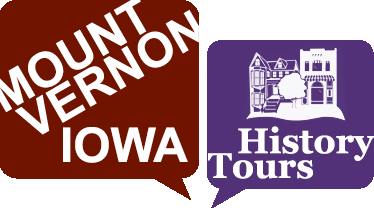 Brad Kane '18 and Hannah Robertson '18, “South Hall,” Mount Vernon History Tours, accessed April 23, 2019, http://mtvernonhistorytours.com/items/show/26. Charles Milhauser, “South Hall: Demanded then abandoned,” Cornell Report, Winter 2003, College Archives. Ibid. “The New Boarding Hall,” The Collegian, Cornellian Records, Vol. 4, No. 3, College Archives. 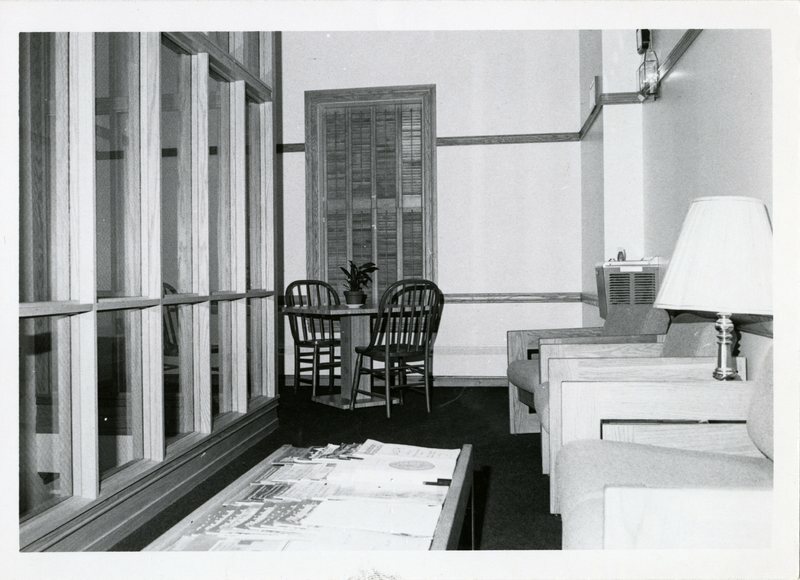 Milhauser, “South Hall: Demanded then abandoned.”  “Historic South Hall," June 12, 1982, College Archives. Ibid. ; C. William Heywood and Richard Harlan Thomas. 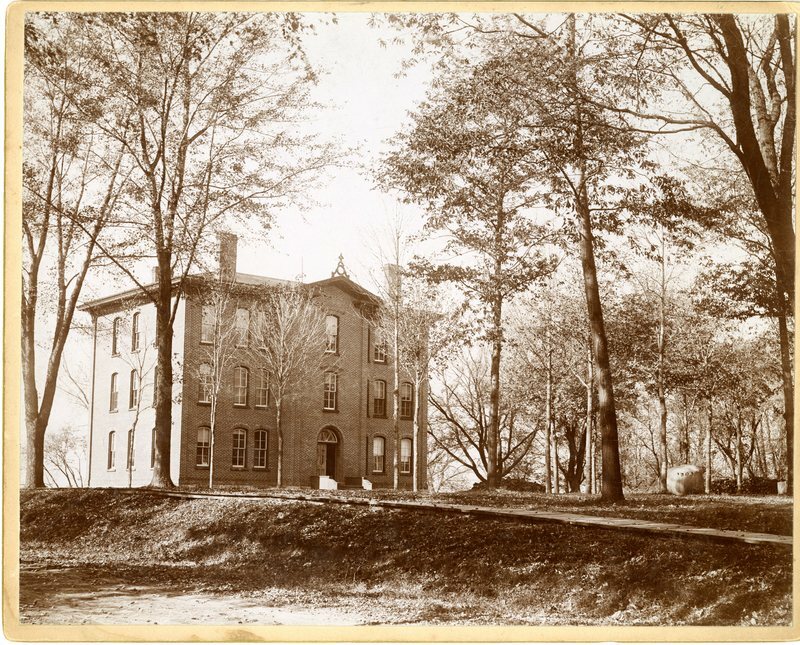 Cornell College: A Sesquicentennial History, 1853-2003. Vol. 1 (Cedar Rapids, Iowa: WDG Communications Inc. 2004). Milhauser, “South Hall: Demanded then abandoned.”  Elmer J. Miller, “South Hall,” October 11, 1975, College Archives. Ibid. Milhauser, “South Hall: Demanded then abandoned.”  Ibid. 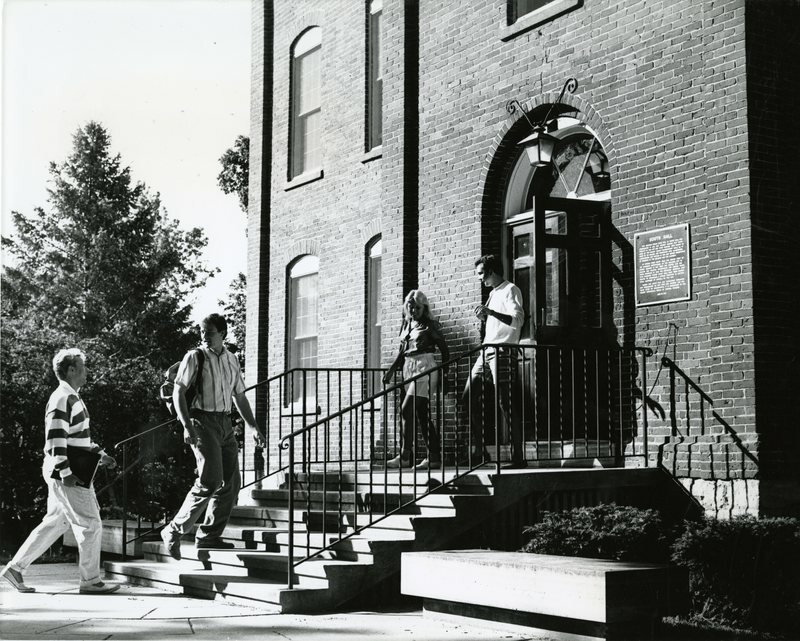 Jeff Beatty, “Faculty in South Hall Struggle Through Moving Day," The Cornellian, December 14, 1981. Miller, “South Hall.”  “Historic South Hall.”  Curt McConnell, “African Queen among Cunards., Hillside Press idle for 15 years,” The Cornellian, February 16, 1981. Terri Melrose, “Old Chandler-Prices Never Die, They Get Sold,” The Cornellian, December 7, 1981. Elizabeth Jane Isaacs, “Echoes of South Hall--1873-1982,” College Archives. Ibid. McConnell, “African Queen among Cunards.”  “Building on literary history,” Cornell College Report, March 2012. Accessed June 17 2016. Clyde Tull, “Dear Clansmen," Letter to English Club, September 14, 1947, College Archives. Ibid. Clyde Tull, “Dear Clansfolk,” Letter to English Club, October 27, 1961, College Archives. R.P. Dana, Letter to President Arland F. Christ-Janer, Howard W. Taylor, Charles Cochran, Winifred Van Etten, Liz Isaacs, Bernard Richardson,” College Archives; Melrose, “Old Chandler-Prices Never Die, They Get Sold.”  Lang Stern, “Cornell’s Chapbooks-A Break for Young Writers,” The Cedar Rapids Gazette, October 11, 1959, College Archives. Melrose, “Old Chandler-Prices Never Die, They Get Sold.”  McConnell, “African Queen among Cunards.”  Ibid. Dana, Letter. Melrose, “Old Chandler-Prices Never Die, They Get Sold.”  Ibid. Curt McConnell, “African Queen among Cunards.”  Ibid. Ibid.